Information about budget travel, cheapest weekday deals, cheap travel deals. Sports Team Group Travel Lodging Reservations, AAA approved! How do you choose the perfect cabin for your family? We're here to help. Studio cottages, 1,2,3,4,5 and even 7 bedroom vacation rentals at budget rates. Even the famed Golden Bear Cottages has a road less traveled: on weekdays. Not only does this beautiful stretch of one of America's most scenic mountain drive see less traffic on weekdays, but great lodging is also more affordable. 1 to 7 bedroom Clean Big Bear Lake cabins for rent, pets are welcome for our Big Bear travelers. Looking for great deals and discounts on cabins or cottages in Big Bear. Yes, we have all sizes. Owners: Don and Karen DiCarlo, Lisa and Lenny Duran have come up with the very best AAA approved budget vacation cabin rental deals! Low cabin reservation rates. "Free Day" special: pay for 2 available nights and get the 3rd night lodging FREE if you can stay for 3 days. Not valid on holidays. Call for our specials on weekends and Big Bear group lodging too. Enter promo code AAA3. Then enter the number in your party and your 3 preferred weekdays in the reservation box at the top left side of this page and you will be given 1 "day free". Click on the GO button at the top left side of this page and check as many different dates as you want before you make a reservation. We have a limited number of pet friendly cabins with fenced yards where well behaved pets are welcome. Free Pleasure Point Marina boat rental coupons. Free local restaurant and shopping coupons to all guests. Military or AAA discount is available on additional 2 day reservations. 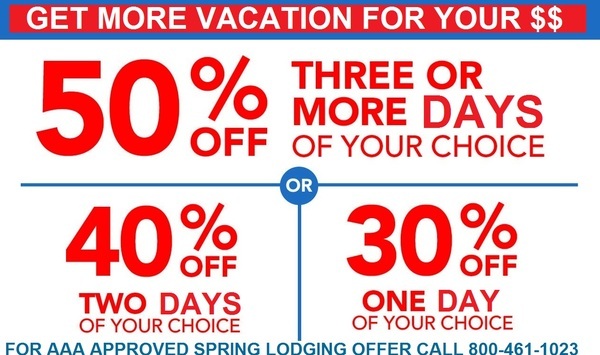 Discount vacation offers can't be combined. We are available with all the details at 1-800-461-1023 if you have difficulty making a reservation online and you still get the lowest cabin rental discount rate. 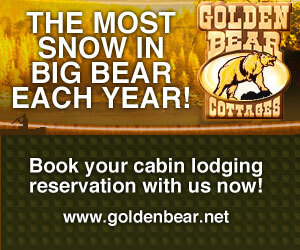 Ask about our weekday deals on Big Bear group lodging too. All sizes of groups welcome. Limited number of pet friendly cabins with fenced yards where well behaved pets are welcome. BIG BEAR LAKE BUDGET TRAVEL - Here's what's new at the zoo. The latest development in the Moonridge Animal Park's relocation project is an artist's nearly complete 3D scale model of the new wolf enclosure. "This should be a very nice project," Derry said. "A Disney artist is working on the project model." The model unveiling is set for 3 to 4 p.m. May 21 at the Big Bear Parks and Rec office, 41220 Park Ave., Big Bear Lake. The zoo's new site is a 10.4-acre parcel in the Moonridge area of Big Bear Lake. "The property was purchased at a cost of $2.1million - a steal in that area. The new site is near utilities and needs minimal grading," Derry said. "We'll develop 7.5 acres for the zoo, and the rest will be a riperian area." Plans for a beer garden are also in the works. An environmental report should be completed by August, Derry said. "The best-case scenario would be to have a possible grand opening one year after that - August 2013," he said. The project is in the Initial Study review process. What makes the Moonridge Animal Park unique is that all zoo inhabitants were rescued. Of those, 75 percent are returned to the wild, with just 25percent kept as permanent residents. The park is home to more than 100 animals - from snakes to bears. grizzlies, wolves, coyotes, mountain lions and bobcats, foxes, raccoons and eagles, docent Pam Brostedt said. "We are not a zoo," said staff member Margaret Schwab. "We're a rescue organization, and all the animals who need to be here are here." The current Moonridge Animal Park is open daily year-round - except for Christmas Day. "I'm really excited about this project," Derry said. "The current park is open, and we invite people to come up and enjoy it now," Derry said. For more information, call Moonridge Animal Park at 909-584-1299.